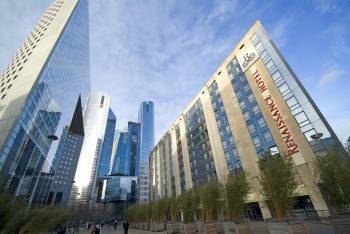 The Renaissance Paris la Defense Hotel is situated in the heart of la Defense next to Paris.Near the Grande Arche, this four-star hotel is located few minutes away from area’s famous attractions and one train stop from the Champs-Elysees. Guests of the Renaissance Paris la Defense can walk to one of the biggest mall of Paris “les 4 temps” open 7 days a week.Whether you come by train, metro or taxi from Paris airports, the access to the hotel is easy. The hotel has a supervised private parking. This upscale hotel provides spacious guest rooms.To assure successful conferences and events, there are 13 meeting rooms with natural daylight and broadband Internet. Guests can enjoy traditional French cuisine in the hotel restaurant and a relaxing atmosphere at Bar Le Colonial.